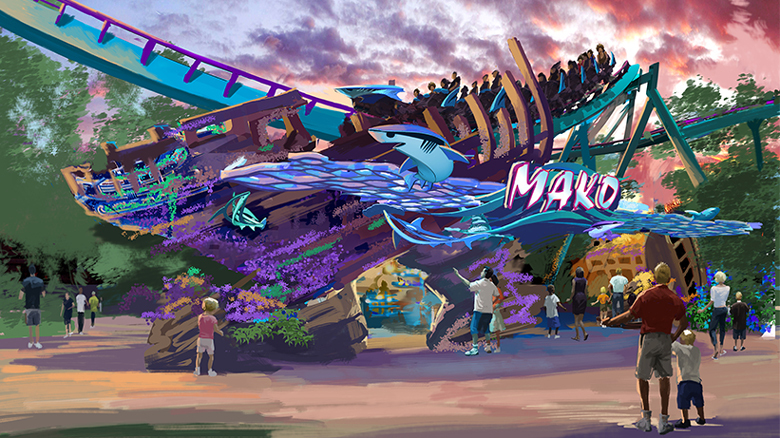 Sea World Orlando recently announced that they will be building a new thrill roller-coaster, Mako. The ride is scheduled to open in the summer of 2016. Mako will be more than your typical roller-coaster and is being referred to as a hyper-coaster. When completed, Mako will be the longest, fastest, and tallest roller coaster in Orlando. It will reach speeds up to 73 mph along a steel track that is 4,760 feet long. With this addition, Sea World Orlando although not known for their roller coasters will now have 5 thrill rides for guests of all ages to enjoy, aside from their great exhibits and shows. Mako is named after one of the fastest sharks in the ocean. A fun fact about Mako sharks is that they are commonly referred to as blue pointers. They are also known for their top speed, extreme jumps and the ability to quickly change course as they pursue their prey. The ride is designed to have passengers feeling breathless and weightless as they mimic the movement patterns of the Mako. Traveling at top speeds, experiencing tight turns and steep drops in a few short minutes will be the highlights of this hyper-coaster. The ride will include a special surround-sound system and at night, the ride will display specialty accent lights that will flicker and shimmer to simulate what it’s like for a shark on the hunt for its prey. If you enjoy a rush of adrenaline, then this ride is designed for you. Be sure to buy your Sea World Orlando in advance at www.knowbeforeUgo.com or call us at 1-800-749-1993 When visiting Orlando you can also visit us at our world famous Welcome Center located at 8000 International Drive,Orlando, Florida To pick up your FREE area and State maps and discount coupons to restaurants and local shopping . Be sure to visit knowbeforeUgo.com for all the latest news and updates.